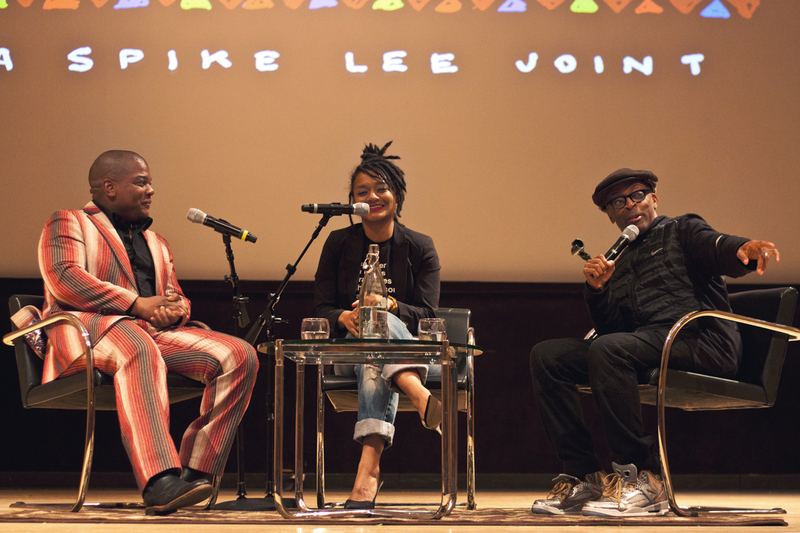 The discussion primarily focused on the ideas of representation and collaboration in the visual arts–works by Wiley and Fazlalizadeh are featured in Lee’s latest film, Da Sweet Blood of Jesus. The film, a revenge thriller which uses vampirism as a metaphor for black assimilation and white cultural imperialism, explores appropriation and the cultural intersection of various forms of visual arts. Wiley’s work, on the other hand, largely subverts traditional ideas on appropriation and replaces European aristocrats with everyday African Americans in the artist’s personal interpretations of paintings by Old Masters. Wiley said he was in love with the great portrait artists and wanted to see “black and brown kids on museum walls.” In his more recent travels, he discovered firsthand that the “leading cultural export of America has a black face”– considering the worldwide popularity of rap and hip-hop culture–and the artist’s current works attempt to respond to this idea. The following is a clip from the Q&A session that addresses storytelling and representation in regards to making work based on someone else’s experiences. The first voice you’ll hear after the question is Lee’s, followed by Fazlalizadeh, and ending with Wiley’s response.